Quick Take: The Big Bang Theory, "The Russian Rocket Reaction"
Review: The Big Bang Theory, "The Russian Rocket Reaction"
(S0505) This week, Howard gets a chance to go up to the space station with his team's new telescope as the mission specialist, and Bernadette takes it badly. She doesn't want him to risk a trip to Russia to use the Soyuz shuttle, or the dangers of space. It comes out that she was always afraid for her dad's safety since he was a cop, and she doesn't want to live that way with him. She does feel bad, though, so she tells him that she doesn't want to stand in the way of his dreams... and then tells his mom about the whole thing. She forbids it, of course. Girls' night gets her to realize that she shouldn't have gone behind his back, and they make up, but his mom is still against it. Meanwhile, Sheldon and Leonard have decided to start a fantasy sword collection, and while they're getting their first one, Wil Wheton comes into the shop and invites them to a party he's having. 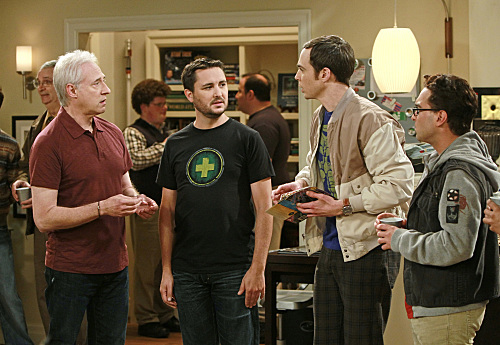 Sheldon doesn't want to go to his mortal enemy's party, but Leonard does, and they spend most of the episode with Sheldon insisting that until the moment he goes to the party, Leonard is simultaneously still his friend and no longer his friend. In the end, Leonard gets Sheldon to go by telling him Brent Spiner is going to be there. Wil makes up the insult that caused the rift ages before -- he didn't show to a convention Sheldon had driven six hours to get to -- by giving Sheldon a mint condition, signed Wesley Crusher action figure. So now they're best friends, whether Wil wants it or not. And then Brent comes and ruins the collector's value, so now he's the top of Sheldon's list of mortal enemies. It's always great to see Wil Wheton around the geekverse. He's the idea that geek guys should be striving for--silly and enthusiastic, but also functional and literate. And here, it's nice to see him and Sheldon resolving their differences. After five years, the jokes have to change a little, or they get boring, and doing it this way, it opens the door for more Wil Wheton episodes AND brand new Brent Spiner episodes. Since this show is not really reality, they get to both be exaggerations of themselves, which means all sorts of fun for the writers and the actors to explore. Plus, you know, more geekiness for this already pretty geeky show. Bernadette's story was a little less charming. It sort of slid into cloying by the end, though it was saved by the fact that she did understand that what she'd done was wrong. The scene in the car was probably the longest scene I have ever seen on this usually super-fast-paced show, and while it's great that she and Howard have something strong and real, it started to read as a 'very special episode' about compassion and support. If this was a longer show, it might've been too much. Bernadette is best when she's being gleefully amoral about deadly viruses, not when she's playing the manipulating wife. Overall, a fun episode, though! I think Bernadette would have been less surprised that Howard would want to go into space. Just about all geeks want to go into space. She did have a point that he should have talked it over with her, though. This was a high-quote sort of episode, and I could probably quote the whole thing, but here are the ones I remember the most.